Multi-Material Cutting Sliding Mitre Saw. Max. Cross Cut: 230mm x 65mm. Ensuring accuracy & increasing productivity. Make angle adjustments accurately & easily. designed for left & right handed use. With the 210mm diamond blade (sold separately). For additional accuracy and faster adjustments. Protects against damage and prevents dust ingress. Dust bag and port adaptor for vacuum extraction. Easy to move and transport around the workplace. Go premium and equip yourself with the best 210mm sliding mitre saw on the market. Multi-material cutting technology with all the features you'll need to get the job done. Delivering accuracy, reliability and the power to handle heavy-duty materials - the R210SMS+ is truly superb value for money. Precision cutting with laser guidance, trench cut facility, 230mm slide, 0˚ - 45˚ bevel and 50° - 50° mitre settings. 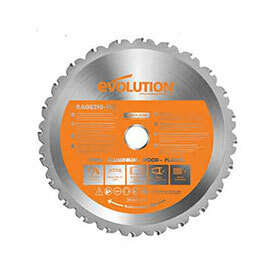 Reliability at the forefront of Evolution saws ensures smooth, square cutting every time in a variety of materials. 1500W of hi-torque power & optimised gearbox to cut mild steel, wood with embedded nails and more. Perform accurate Cross cuts, Mitre cuts, Bevel cuts and Compound cuts with adjustable precision settings. Compatible with the Evolution Mitre Saw Stand and 210mm continuous rim diamond blade for cutting tiles, brick & ornamental stone, (sold separately). Slide rail protector included protects against damage & prevents dust ingress. Cleaner & safer working environment with dust collection bag & dust port adaptor for use with vacuum extraction.